I decided to take a walk around my lovely neighborhood today with my 4-month-old son. It was such a beautiful day and I could really use the exercise, so I packed up his little stroller and off we went down Temperance Street. As indicated by the title, we live in English Village, a wonderfully serene neighborhood in Southeast Huntsville. And I do mean soul quieting calm. I would say to close your eyes while I describe this to you, but just go there in your mind. The sun was shining, and it was a pleasant 75 degrees. As we walked I could smell the fresh air, you know the type I am talking about, the clean spring air that absolutely sings of new blooms and vitality. There was the gentle hum of a lawn mower in the distance and a soft breeze rustling the green leafy trees. It was heaven! I was overwhelmed with the feeling of how much I LOVE living here, and as soon as we got back home just had to share it with all of you out there. This area completely speaks me. English Village is a nicely established neighborhood. We have solidly built houses, most of which sit on cardinal directions. For example, my husband and I get to wake up with the morning sun streaming into our master bedroom and watch it set in the evenings from our front porch. The natural lighting is so outstanding that we rarely have to turn on the lights during the day. One of the other things about the houses that I love is opening all the windows and doors which creates the ultimate cross breeze. All the yards have beautifully full grown trees which provide excellent shade that beacons you to come outside. And when you are outside, look around! The homeowners here are proud of our little slice of paradise and we all put forth effort into the upkeep of our lawns and landscaping. Speaking of the neighbors, let me tell you, it takes twice as long to take a walk with a baby just because of how friendly everyone is. We all wave at each other, and greet one another as we walk by. Occasionally someone wants to say hi to our beautiful little man, which inevitably results in them reminding you to let them know when they can babysit. Call me old fashion, but I do so love Southern Hospitality. 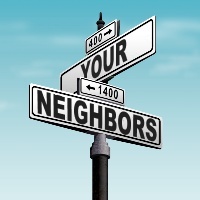 I really enjoy when neighbors know neighbors and when we can all say hello to one another, and in English Village we are just about amok with charm! The location is just about second to none. We are a stones throw away from Redstone Road and the Arsenal. We have a Wal Mart within walking distance, though I have never personally walked to it. And you can get to the parkway withing a matter of moments and from there jet to anything you need. We are also within the Challenger and Grissom school districts too! I noticed today a few houses up for sale in the area, but I never see the same sign in the same yard for too long. It is a great area to find a turn key home or one that needs a little tlc. We are renovating like crazy here in Southeast Huntsville, just see Donna Marie Chiroux’s blogs about their current remodeling project. English Village is no exception to the increasing property values of Southeast Huntsville. We have plenty of big lots for expanding and updating, but no so big they become unmanageable, and we certainly have the market to support the growth and investments. If you haven’t taken a drive through our meandering peaceful streets lately, you are doing yourself a disservice. Looking for a guided tour in selecting your next residence? Give me a ring at 256-337-9443 or shoot me an email.